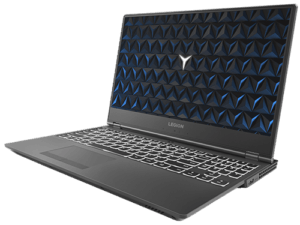 We have covered a lot of gaming laptops in our blogs over the years, big ones, little ones expensive ones, less expensive ones, but usually, they fall into two main categories. Cheaper ones that are bigger, thicker and less nice- looking, and more expensive ones that look better but the price tag is invariably higher. 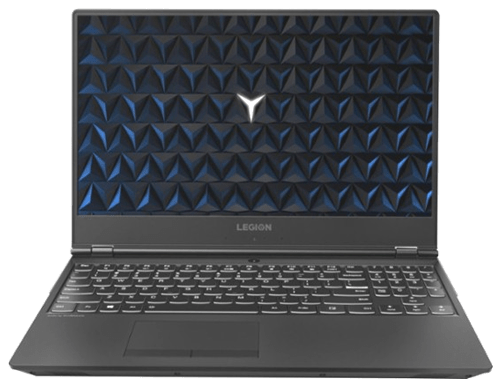 Since last year Lenovo sell laptops for gaming in new line called Legion. 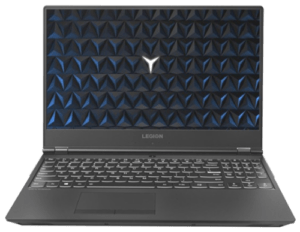 This is the Legion Y530, and its main strength is the design. 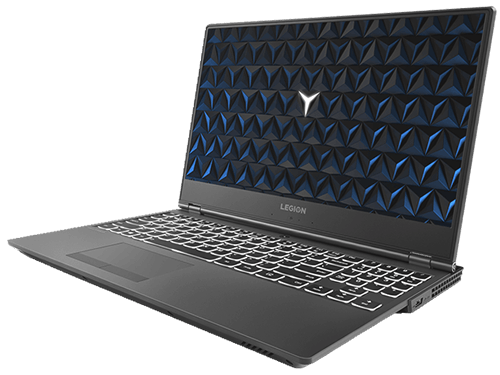 It’s one of the best-looking devices that you are going to get for this kind of money for a gaming laptop, oh yeah, it’s retailing for about $930. It measures 14.4″ x 10.2″ x 0.95″ and is reasonably light at 5.07-pounds. The big thing that makes it special is the bezel on the screen. It’s very thin and it reminds me of much more expensive laptops. The Dell XPS 15 was probably one of the first 15-inch laptops that used a thin bezel like this. A lot of the gaming laptops nowadays are going with bigger screens with thin bezels and it looks nice. The main advantage of having a thin bezel isn’t just for the fact that it’s a thin bezel device, right? Obviously, it looks good, but it also makes the whole device smaller. When you have less bezel that means the footprint of the entire device is smaller. So, in turn, it makes it a more portable and more compact device. The design on this laptop’s exterior is a much more muted look than we traditionally see from Lenovo. Lenovo was one of the bigger companies with the red and black scheme. They loved that and played it out for several years. This year, it’s all black. It doesn’t have a single drop of red on it. There isn’t’ even a red LED. There’s only one light up front and that’s in the “O” of the Legion logo when it’s on. It’s a simple white light and there is no controlling it or changing it with RGB settings. It’s just a little white light that looks good. The top surface of the lid is a textured plastic. It’s basically a radial pattern that originates from the “O” in the logo and then just spreads out. It has a very durable finish despite the textured surface. It has a really solid build quality. It feels good even though it’s not amazing or anything. Overall it’s a predominately plastic laptop. Though it is a plastic laptop, nothing stands out as being any sort of critical issues with it. The hinge system that they have used here is much better than their previous years. Some of the older Lenovo laptops had a really bad hinge design, but this is a good one. it also feels well-made. It is kind of surprising that they changed the design of this laptop so drastically from the previous year. 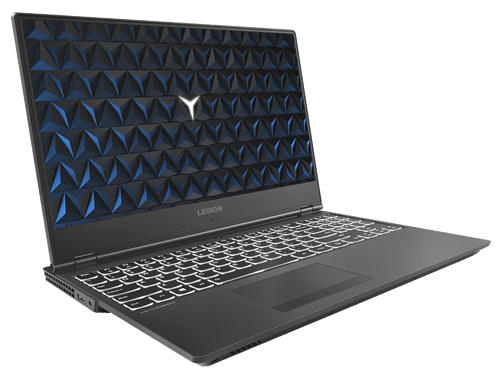 It looks nothing like the original Y series laptops from Lenovo. It looks completely different and we like it. It has improved across the board. The back of the laptop extends a little bit beyond the base of the screen and it’s a design element that usually helps with improving the thermals on a laptop. The ports are also on the back of this device, at least most of them are. There’s still an audio jack and a USB hub on each side, but the main cluster of ports is on the back. This clearly is a personal preference, but I like having all of my connections neatly tucked away on the back. Unfortunately, the USB isn’t Thunderbolt 3 capable and at this price point, it is expected. Inside the device, we’re looking at a keyboard deck that has soft touch material everywhere. This is a nice material at first, but over the long haul, it can kind of get gunky. That being said, there are some brands out there where the soft touch material had held up over time. The jury is still out whether or not this will gunk up or not. The keyboard itself is good and I like how they’re done the layout. On a traditional laptop, you’re either going to have and a spacious keyboard that doesn’t have a number pad or a cramped keyboard that does. However, Lenovo has done something quite different. They have their regular layout and it’s spacious, but their number pad is actually above the arrow keys. They’ve actually made really good use of this. It’s a different layout than a lot of other keyboards, but I think this is something that’s easy to get used to. The only concern is if you’re someone that uses the number pad a lot, you will have to develop a different kind of muscle memory in order to avoid the arrow keys. It has a great trackpad. It had dedicated hardware buttons that is not common these days. It has Windows Precision drivers so the tracking is great. The only thing worth mentioning negatively here could be the loud clicking mechanical buttons. The Harmon speakers sound good and they are positioned well in the beveled area up front. The bass isn’t great because the lowered frequencies aren’t represented, but this is normal. It’s a laptop, and laptops don’t generally have much bass if any. To get inside this laptop is relatively easy. You do have to struggle with the tabs a little bit on the bottom. It’s just a bunch of screws and they come off easily, but you do need to be careful opening it because there are plastic tabs that hold it in place. Once you are inside you have access to everything. You can swap out your two RAM slots, and two drive slots. There’s an NVME and there’s a 2.3″ SATA. You also have access to your 52 watt-hour battery. It’s not particularly large, in fact, it’s actually relatively small and the battery life on this thing is only a bit over 4 hours with the screen at 250 nits. A lot of devices like this are going to have shorter battery lives, but so far, this is the shortest. You will need your charger with you to get through a day. The screen is money. The design of this screen is seriously the best part of this laptop and it makes it look like a much more expensive device that it really is. It’s reasonably color accurate with sRGB 73% and Adobe RGB 58%, it’s good enough for gaming. It’s only a 250 nit screen, so if you’re in a high-light area, it could be hard to see it well. The webcam is down on the bottom, it’s a nose cam. This device comes in a few configurations, you get a GTX 1050 or a 1050 Ti. The 1050 Ti’s performance is good, but you aren’t going to get anything mind-blowing. You will be able to play most Triple-A games near 60 fps, but you will have to play with the graphics slider a bit. The thermals on this device are good. It doesn’t throttle and the fans aren’t super loud, even with a max load. I do like that there are software controls for the fans, so if you want to you can put on the maximum fan load and let them rip. It’s nice that Lenovo was able to make something that looks likes this in a thermally appropriate chassis. That’s not easy. A lot of companies try and just don’t have great thermals and don’t really care about it. The Y530 doesn’t have a particularly powerful card. it is a 1050 Ti, I would really have liked to have seen a 1060 or at least a 1060 Max-Q because I feel like the chassis could handle it. The thermals are good enough, but they just don’t offer that option and it doesn’t make sense to me. Especially because there’s a 144 Hertz screen option. They have a high refresh screen available, but not a particularly powerful GPU. Maybe in the future they will have more powerful GPU options.